My love from salsa continuously grows. When I say this, one might not be sure whether I’m talking about a condiment or a dance. In this case, it’s the condiment. Though, recently I returned to the dance and couldn’t be more happier. 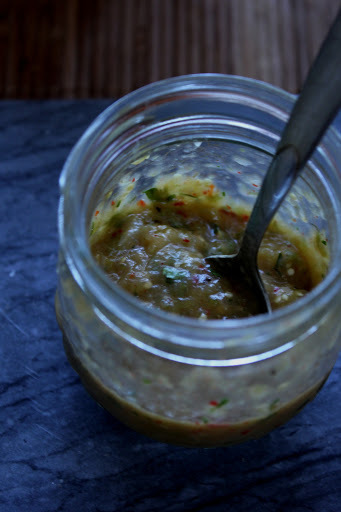 This my friends, is a simple to prepare, but complex in flavor Roasted Tomatillo Salsa. The recipe is rather easy to make and the ingredient amounts can adjusted to suit your taste. 2. Coat tomatillos, onion, and chilies in olive oil. Season with salt and pepper. Spread the vegetables in a single layer on top of a baking sheet. 3. Roast the vegetables in the preheated oven, stirring occasionally, until caramelized and softened, about 25-35 minutes. 4. Puree roasted vegetables with the remaining ingredients until you reach desired consistency. I like mine a bit chunky. Season with salt and pepper to taste. 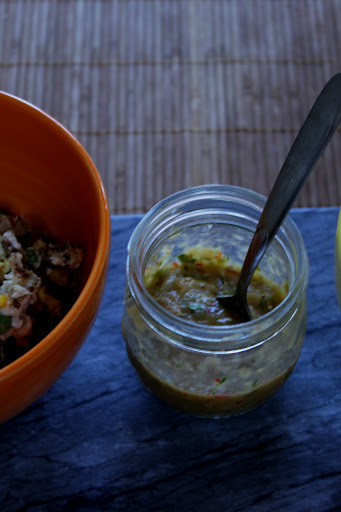 Use the salsa to top sandwiches, salads, grilled meats, or scrambled eggs. 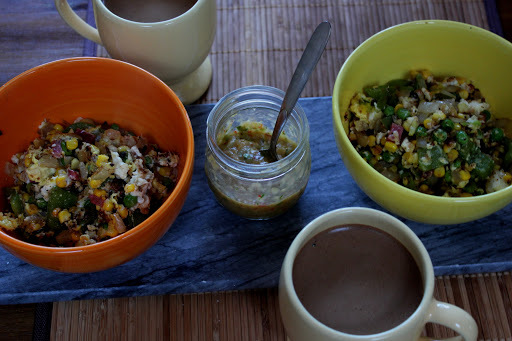 Are you drinking hot chocolate and eating salsa/salad? Thank you! Hope you enjoy the results.